Parenting – my books. my life. I love when Trish hosts these Days in the Life blogger events. Check out everyone’s posts here. I’ve done this three times before, but all during the week. So here is what a random Saturday looks like. It’s still pretty exhausting. 12:36 – Feed Kai. Tried to skip the dream feed before I went to bed. Nope. I think I’d been asleep for less than an hour. 5:00 – Send Ben in to calm Kai. Temporarily works. 6:40 – Realize that Ben must have gotten up with Evan a few minutes ago. Bask in the opportunity to sleep in. 6:42 – get in an argument with Gatsby about whose pillow it really is anyway. Ruin the pillow case in the process. Think about how we could really use some new sheets. 6:43 – Hear Kai crying. Sigh. Get up. Hand the baby to Ben. Go brush my teeth. Check Facebook/Instgram. Linger upstairs. 6:52 – Ben tells me I can go back to sleep but I’m awake now. Realize we have no tea. Tell Ben we need diaper cream (teething, ugh). Throw Ben a diaper so he can change Kai. Lay down on couch. Watch Disney Jr. I’m starving but too lazy to go into the kitchen. 7:15 – Grab a banana and some orange juice. 7:20 – Play blocks with Kai. I build. He destroys. 7:38 – Clip Kai’s nails after he scratches me for the 17th time this morning. 7:50 – Diffuse some essential oils to try to wake up. 7:53 – Ben leaves to go do some work. The kids eat Cheerios. I try to figure out what to do with our morning. 8:03 – Evan suddenly realizes he has an unfinished art project from school and requires a green crayon immediately to finish it. 8:07 – Get the kids fruit. Put on music. (The hand clapping and foot stomping Songza station). 8:20 – Get Kai dressed. This might be the hardest thing I’ve ever done in my life. 8:37 – Help E into a Superman cape. Put my own superman cape on. Race through house. Get yelled at for dancing instead of running. 8:45 – Sit down to make to do list of weekend chores. Evan asks to make his own. He says his chores are going to bed, eating dinner, and listening to mommy and daddy. It’s adorable. 8:55 – Move E to kitchen table because dry erase markers and the couch don’t mix well. 8:58 – Nurse Kai. Think of that Army saying about doing more things before 9am than most people do in a day. 9:20 – Change Kai’s diaper. 9:32 – I’m starving. Try to find some actual breakfast. Eat Cheerios with chia seeds and almond milk. I’m still hungry. 9:40 – Ben comes home. 9:50 – Ben and Evan leave to run errands. I try to put Kai down for a nap in the swing (I don’t have the energy for a crib nap attempt). This kid is TIRED. 9:55 – Remember that I need to get a move on my audio book for book club next week. Open computer to load discs but get interrupted because Kai is NOT HAPPY with the current plan. 9:57 – Nurse Kai to calm him down and get him to sleep. 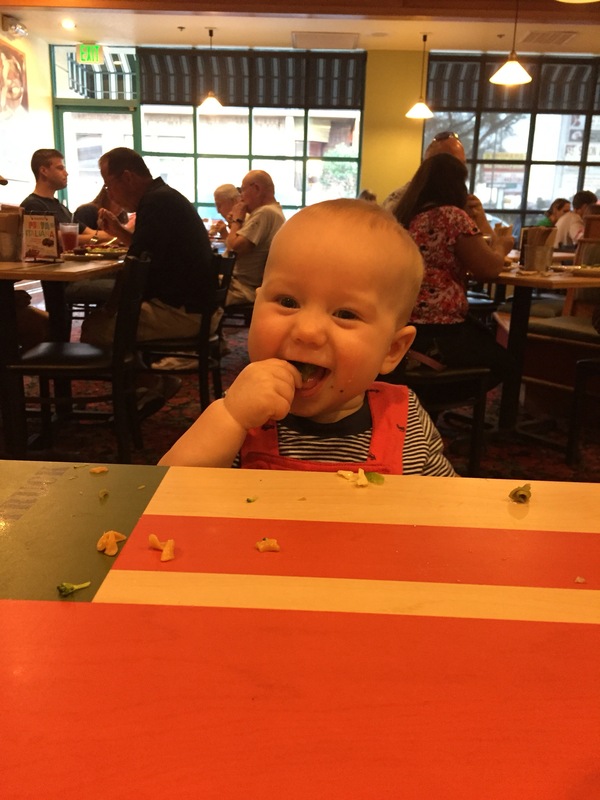 You’d think the kid had never eaten before the way he is acting. He nursed an hour ago. 10:08 – Snuggle with a sleeping Kai for a minute. 10:10 – Transfer sleeping child to the crib. Lol. Just kidding. Baby is now awake and standing in the crib. Leave him there anyway. 10:15 – Kai is wide awake in his crib. But not crying. So I eat burnt toast with Nutella and watch an episode of Fuller House. I was going to clean my car out during this nap but it’s been an unproductive day. I may as well keep the theme going. 10:27 – Kai is lying down. Maybe he’ll sleep. 10:28 – Nope. Standing back up. 10:37 – He’s lying down again. 10:38 – Just kidding. It’s now getting to the point that I might not actually want him to nap. 10:47 – Go get Kai. Why are weekend naps so hard??? 11:10 – Change Kai’s diaper. Get dressed for yoga. 11:30 – Baby and Me Yoga! 12:30 – Nurse Kai at the end of class, chat with my friends for a few minutes, head home. 12:55 – Kai falls asleep in the car. Stick his car seat in the swing. 1:00 – Shower. Get dressed. 1:20 – E is in his room for some quiet time and Kai is asleep so I grab an apple and some peanut butter and crackers for a quick lunch. I am in desperate need of some caffeine. 1:25 – Kai wakes up. This kid does not want to sleep today. Change him and get the kids ready to leave the house. 1:35 – Head to a birthday party. 4:10 – Head to the supervisor of elections to vote. 4:30 – Head home. Discuss dinner plans. We are excellent meal planners during the workweek. Not so much on the weekend. 5:00 – arrive home and sit in the car for ten minutes while the boys nap. 5:30 – Decide to go out to dinner. We pick Sweet Tomatoes. No waiting and Evan can eat whatever he wants. Kai is so cute we had to talk to a lot of people. That bald guy in the background there came up to our table and rapped for us. Seriously. 6:56 – Home. Play for a few minutes. 7:50 – Mess around on my phone for 20 minutes. 8:15 – Switch laundry, Watch House of Cards with some tea. Research potential new shampoos for the entire second episode. 10:04 – Realize we need to change the clocks forward and go to bed because it’s essentially 11pm. I haven’t accomplished anything on my to do list. I haven’t been around much. I know. It is taking me about 6-8 weeks to read a book and I don’t have much motivation to review any of them. These posts were well-received in the past so I thought I’d do a new day in the life of post to show you what I am doing instead. 5:45 – awaken to the sound of a baby pooping, bask in the amazing amount (6 hours) of uninterrupted sleep I just got, realize Ben is still home, request baby changing services, sleep for two more minutes. 7:17 – give E the option of getting ready for bed or reading books by himself while I put Kai to bed. He reads. Put Kai to bed. It turns out that having a nursing babe and a preschooler and a job is a bit of work. But I’ve figured out my routines and Ben has figured out his and we’re managing quite well, I think. But, I can’t figure out when to fit in reading and exercise. It’s all audiobooks and weekend runs for the foreseeable future. I’m told it gets easier. I like to believe people when they tell me that. It wasn’t too long ago that I shared my Day in the Life post. But Trish from Love, Laughter, and a touch of Insanity is hosting a Day in the Life Blogger Event so I thought I’d join in. My last post was a pretty light workday. Since I had a trial during the first part of this week, I thought I’d share what a busier day is like for me. My first post was heavy on the parenting. This post, not so much. 5:30 – Ben gets up. I hear him today because I haven’t slept well (pregnancy combined with a fear that I will oversleep). I go back to sleep. 6:20 – My alarm goes off. Ben is gone. I think he leaves around 6am. I hit snooze. 6:30 – Alarm goes off again. I check my email then get out of bed and get ready while watching an episode of Gilmore Girls. 7:00 – I get Evan out of bed. He’s sitting up and waiting to show me that his owl nightlight is green and that it’s time to get up. I get Evan dressed and we go downstairs for his breakfast. He eats yogurt and cereal while I drink some orange juice and make his lunch. 7:22 – We are both ready and head out the door into a torrential downpour. We are soaked by the time we get in the car. 7:30 – Arrive at E’s preschool at the earliest allowable time. He is the first one there and asks where all the friends are. It makes a working mom feel good. 7:35 – I start driving to Tampa. In the torrential rain. It is a 25 mile drive. It takes me an hour and 15 minutes. At least I have an audiobook. And some tea, a granola bar, and a pear. 8:50 – Arrive at the court house, 20 minutes after our 8:30 court call. My boss is meeting with the defendant (he has no lawyer) so I join them. 9:40 – We are done meeting with the defendant and are waiting for another case to pick their jury before us. I check my email throughout the day just to stay on top of it. And to argue with my organic coop over whether or not we actually get a share this week. As you do. 11:00 – We return to the courtroom. The potential jurors have accidentally been excused until 1pm so we discuss a few matters with the judge before an 11:30 recess. 11:30 – Meet with defendant to go over exhibits. 12:05 – “Lunch.” We review potential jurors and eat Jimmy Johns in a tiny little conference room. 12:45 – Back in the courtroom to pick our jury. 2:00 – Jury is picked and we proceed to opening statements. 3:00 – We call our first witness. 3:45 – We call our second witness. 4:35 – We rest. Judge calls a recess until tomorrow at 9am. Boss and I briefly meet to plan for tomorrow. 4:55 – I leave the courthouse and head back home. I listen to my book for a bit but then I get bored so I call my mom. We have an interesting chat. 6:20 – I arrive home. The same 25 mile drive took me an hour and 25 minutes during rush hour. And there wasn’t even any rain. 6:25 – I sit down to the family dinner that is already in progress. 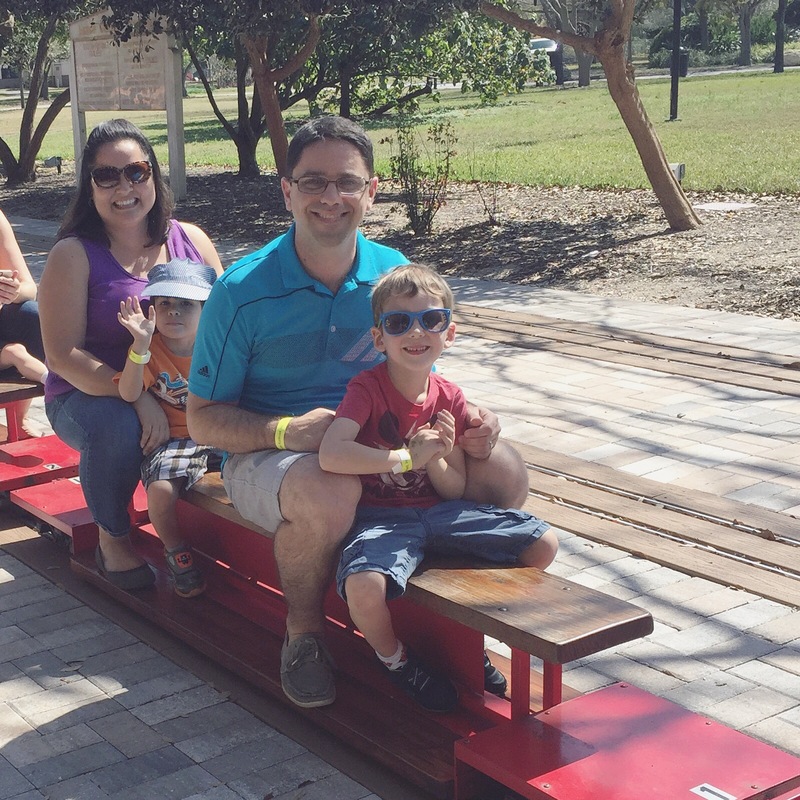 6:45 – We send Evan to play independently on the lanai while Ben and I chat about the interesting conversation I had with my mom. 7:00 – I take Evan upstairs to play for a few minutes while Ben puts E’s laundry away. 7:15 – I start to get Evan ready for bed. It’s not bath night, so it’s just getting him in pajamas, washing his face and hands and brushing his teeth. Ben and I tag team this. Then we all read three stories (Green Eggs and Ham, Sleepytime, and Hogwash). 7:30 – We say goodnight to Evan and leave him in his big boy bed. He doesn’t go to sleep right away, but he doesn’t get up. We’ve started putting him to bed at 7:30 instead of 8 to see if it helps the nap situation. 7:35 – I take a shower while Ben does dishes. 8:00 – Ben takes a shower while I watch the last ten minutes of that Gilmore Girls episode and fold a load of laundry. 8:10 – We make the grown-up decision to do work WITHOUT the tv on. I prepare notes for the closing argument for tomorrow. Ben starts a load of laundry so that I can have pantyhose for day two of trial tomorrow and then sits down to do some lesson planning. 8:45 – I send my boss an email, check to see if there are any other important emails I may have missed while in trial (or traffic), and put my work away for the night. 8:46 – Ben is still working so I come here to write up this timeline. 9:06 – Ben finishes working, puts the laundry in the dryer, and gets us some ice cream. 9:09 – We put on an episode of Friends. I check my email and end up doing a tiny bit more work. Then I mess around on the internet, play with our budget and talk to some friends about – oddly enough – work/life balance. 10:20 – We go upstairs, put away the laundry, and get ready for bed. 10:35 – We put on more Friends but Ben falls asleep right away so I switch to Gilmore Girls. 11:15 – I’m probably asleep around now. My alarm is set for 6:20 again the following day. You should pay attention to all of the things that I didn’t do. I didn’t pick up Evan from school. I didn’t cook dinner. I didn’t do the dishes. I am blessed with a wonderful partner who takes on more than his half of the domestic responsibilities despite working a full time job and adjuncting in the evenings three nights a week. He picked Evan up at 3, parented solo until I got home at 6:20, and even managed to cook us a real meal and have it waiting for me when I got home. I’d love to see what your typical day is like. Join the fun. Check out everyone else’s posts on Trish’s blog. If I am counting correctly, I have taken Evan on 12 different trips involving airplanes, which, including connecting and return flights, adds up to about 30 separate flights. And he’s not even 3 yet. He took his first flight at 7 weeks. And by 7 months, he had been on 8 different airplanes. When people know this, I get asked for tips. I have talked several first time moms through their first flight planning. Which is why I thought this post might be helpful. Now, I only know what it’s like to travel with one child at this point, so my knowledge is limited to that, but it always seems to be the first time moms of singlets that are the most nervous about flying with their babies, so I still think it’s helpful. Maybe I’ll do a follow-up after we’ve flown with Baby Brother a few times. Disclaimer: Babies are absolutely safer in car seats on airplanes than they are on your lap. The FAA agrees. This is common sense but not widely practiced. The reason lap infants are still allowed is purely due to political influence and monetary decisions and has nothing to do with safety. On top of that, checking your car seat is a bit risky and not bringing one means that you have to rely on a questionable seat at your destination (I have never used a rental car carseat and I don’t ever plan on it). That said, I only started buying Evan a seat at 15 months and I am not sure what I’ll do with Baby Brother when it comes time to take him on a plane. Check as many of your bags as possible. You will still have a lot of stuff to carry but get rid of everything you can. This is why I love Southwest – free bags! We usually bring one carryon bag for each of us. A diaper bag for E, a camera bag for me, and Ben’s school bag for him. We bring the car seat and sometimes we bring a stroller. We put everything else we don’t need on the plane into suitcases that we happily check. Evan’s bag has diapers (lots! ), a change of clothes for him and me (I’ve actually had to change my shirt in my airplane seat thanks to spit-up), snacks, a water bottle (which I fill after security), his kindle, headphones, and a couple of books and toys. That’s it. My bag usually just has my camera, personal items, book, and water, and Ben’s just has his school work, computer, and a book. My boss would tell you to embrace the stuff. I say minimize it. I park as close to the airport as I possibly can. We used to use the economy lot, but now I’ll gladly pay 4 extra dollars per day to avoid a shuttle. If you can get a ride, even better. Once my bags are checked, I have two ways of getting through the airport, but they both involve wearing Evan. In scenario 1, I bring a stroller and use it to lug the carry-ons and car seat and, in scenario 2, I borrow my friends Go Go Babyz wheels and turn the car seat into a roller bag and use THAT to lug all of the bags. In either circumstance, I wear Evan through the airport and security, no exceptions. I’ve watched parents go through security where they have to take little ones out of strollers or wrangle energetic or unhappy toddlers while trying to take their shoes and belts off and TRUST ME wearing your kid is so much easier. E is over 3 feet tall and more than 30 pounds and I still throw him on my back in the ergo. I’ve only been questioned about it twice by misinformed TSA agents. Most airports will usher you through the family line, which means you get to skip the long one with all of the common folk and get through security faster. Once you go through the metal detector wearing or carrying a child, they will do a quick test on your hands to make sure you don’t have any explosive residue. It takes a few seconds. Despite the 3-oz liquid rule, you can bring formula/expressed breast milk/liquid snacks for children. Kids under 12 can also leave their shoes on through security. I have no idea why we didn’t check that roller bag, but the rest is pretty accurate for a normal trip. The stroller is used for the diaper bag, my bag, Ben’s bag, and the carseat, but never for Evan. For me, waiting to board the airplane is the hardest part. Some airports have some pretty awesome play areas (MSP, I’m talking to you) which make it so much easier. It’s also a great way to burn some energy since your kid has been cooped up and will be cooped up even more one you get on the plane. If there is no play area, I spend my time chasing E around the airport, which becomes a playground itself. If you have anything to gate check (your stroller, car seat, etc.) don’t forget to get a tag for it at the counter before boarding begins. Some airlines pre-board families and some don’t. I generally fly Southwest where families can board after the A group (at most 60 people) boards. Before the merger with Southwest took full effect, Airtran didn’t preboard at all and, if you didn’t pay extra, they’d assign you all to different parts of the plane. I would then have to get the gate agent to switch them (although I liked the idea of letting someone else hangout with E for the flight while I took a nap). The last time I flew Delta, I was still able to pick seats together for free. On Southwest, where there is open seating, I’ve never had trouble finding seats together when boarding with families (although I still try to get one of us a coveted A spot if I can). Sometimes I have Ben board first to install the car seat since that takes a few minutes. When I’m by myself, it’s a bit more complicated. Picture me with a toddler on my back, two bags on my front, and a car seat over my head walking down a partially-boarded plane. Then picture me installing the car seat while the toddler is still on my back. It’s awkward but a bit empowering. People actually cheer you on. Seriously. And once in awhile someone offers to help. LET THEM. If a stranger wants to carry my carseat for me, I gladly hand it over. If you have a stroller, or if you’re gate checking your carseat, you’ll leave it at the end of the jetway to gate-check. If you are using a car seat on the plane, it has to be used in a window seat. Others will say you need the lap extender to install the car seat but I find it easier to do without it. You might not be able to install the car seat rear-facing, so make sure you’ve adjusted the straps accordingly. Every time I get on an airplane, I swear I have less space. Now that Evan is a toddler, he uses a car seat on planes and he will for a long time. It keeps him restrained and comfortable and safe. Plus, it’s familiar. They only time I let him out is to change a diaper because a taste of freedom is too much for him to handle. Some people let their kids wander the aisle, but I’ve never felt comfortable doing that (E is a runner) and I’ve never felt it necessary on my usual 2-3 hour flights. I am thinking about getting the CARES harness for Evan after Baby Brother is here so we don’t have to travel with two car seats. It’s FAA approved and seems better than letting a 3-year-old use just a lapbelt to me. When Evan was a baby and I flew with him as a lap infant, I would generally nurse him during takeoff and landing. This is supposed to help with the ears but Evan has honestly never seemed to have an issue with the pressure. I will give him frequent sips of water or chewy snacks to try to get his ears popping. We do diaper changes in our seats and only if absolutely necessary. Airplane bathrooms are SMALL. Some of them have changing tables. Some of them do not. I’ve never used one and I’ve changed a lot of mid-flight diapers (I used to say Evan hasn’t met a plane he can’t poop on). We just lay him across our laps and do our thing. (This also where cloth diapers actually come in handy because you don’t even need to get up to dispose of anything). I always change E’s diaper before and after a flight in an attempt to minimize mid-flight changes. If you’re by yourself and need to use the restroom, page a flight attendant. They are usually willing to sit with your kid for a minute while you run to the restroom. I’d wait until all of the beverages/snacks are distributed before asking this favor though. As for entertainment, I have an unlimited screen time and unlimited snacking rule when traveling. Evan’s screen time is limited at home so this is a real treat for him. We even got him his own Kindle specifically for traveling. I pack a large ziplock bag with fruit snacks, crackers, and other treats and Evan gets to pick whatever he wants. I figure one day here and there where he eats four bags of fruit snacks isn’t going to kill him. I also like to fly at nap time and bedtime (in pajamas) and hope he sleeps. But sometimes this backfires. His worst flight ever was last month when I was flying alone with him from DC to Tampa. It was way past his bedtime and he whined and cried from exhaustion for the last hour of the flight but refused to sleep. I usually bring crayons and small toys but we never end up using them. Evan is pretty content watching Mickey or playing a game on his Kindle. I make the whole thing an adventure. Evan loves it when I tell him we’re going to the airport. He loves watching the plane go really fast and take off. He counts it down like it’s a rocket ship and then claims that we are in outer space. He loves being in the clouds. He loves talking to everyone we meet along the way and winning them over with his charm. I am a nervous flyer. When I’m not pregnant, I actually take anti-anxiety meds to help me get through flights. But having Evan with me is a wonderful distraction and it’s so fun to watch him be so excited about something as annoying as air travel. First, PLEASE do not be one of those people who bring a goody bag for all of the people on the plane because it is your kid’s first flight. Your child has as much of a right to be there as the guy rolling his eyes at you as you walk on the plane. Keep your kid from disturbing others as much as possible but don’t let other passengers intimidate you. Most people are friendly and understanding. And if they’re not, that’s not your problem. Your kid might get upset. Your kid might kick the seat in front of you. Your kid might throw up all over you (this has happened to me twice). It’s all temporary and it won’t stop you from getting to your destination. You’re a parent, just do your thing like always. I hope some of you find this helpful. Traveling with a small child seems daunting, but with some good planning, it really is very manageable. Let me know if you have any tips or tricks I missed in the comments. Trish recently posted A Day in the Life as a Working Mom. I loved the concept and I would love to see what a day in everyone else’s crazy life is like. So here is one of mine. This was a light day. It wasn’t necessarily typical, but none of them are exactly the same. 7am – Alarm goes off. I turn it off and let E wake me up since we both had a very late night. Ben went to work at least an hour ago. I have no memory of this – I just know it happened. 7:30am – E wakes up after sleeping in (he’s generally awake around 6:45 but will quietly wait for his owl to turn green and signal morning at 7am). I go get him and he says he’s still tired but he wants yogurt. 7:35 – After changing E’s diaper, I get him yogurt. I make his lunch and eat a banana while he eats. 7:45 – We go upstairs so I can shower. E eats a tortilla (yes, a tortilla for breakfast) and watches Clifford in my bed. He asks me to cuddle for a minute. I can’t say no to cuddle requests. 7:55 – I finally get in the shower. E wanders in after 5 minutes wondering if I am still in the shower. 8:05 – I get ready while trying to keep E entertained. He plays with my makeup brushes and mirror. I get dressed, run a flat iron through my hair, and put make up on. 8:25 – I chase E around the house trying to get him dressed. I succeed only by promising he can hold the mirror again. I negotiate an outfit with him and change a poopy diaper. He refuses to wear shoes. 8:35 – I pack up the car then chase E around the house while he tries to play with my foam roller. I finally catch E and carry him to the car (no shoes still). I yell at him for slouching while I try to buckle him in. Then I feel bad for yelling at him. 8:45 – We arrive at preschool after Evan narrated the half-mile drive for me (complete with monsters and polar bears). I walk E into the classroom and say goodbye (I always get a hug and a kiss). I tell E I’ll see him later and leave him happily playing with his friends. 8:55 – I have a granola bar and orange juice on the drive to work. I listen to NPR because I’m feeling disconnected from the greater world. 9:05 – I finally get to work. This is definitely on the late side for me. I aim for 8:30 but try to at least get there by 9. It’s usually closer to the latter. 9:05 – I work. It’s kind of a slow week. Boss gives me a few projects to work on. I return phone calls and emails. I review some documents. I discuss cases with the other lawyers. I gchat about finances with Ben because I am pretty sure I haven’t really seen him since Sunday (it is Wednesday). I might also do a little tweeting. 12pm – Lunch. The three of us lawyers in the office at noon go out, like those of us who are around do every day. Big boss wanted to go to a restaurant pretty far away so lunch ran a bit long. 1:15-3 – More work. And snacking. 3:10 – I leave work early. 3:30pm – I arrive at my 19 week appointment with midwife. Ben and E meet me there (Ben picks E up from school at 3pm every day). I meet a midwife I hadn’t met yet and really like her. We listen to the baby’s heartbeat and then listen to Evan’s heartbeat. 4:30 – We leave the birth center. I call my mom on the way home for an update on my 89-year-old grandma who isn’t doing very well. 4:50 – We all get home. This is late for Ben and early for me. Evan slept on the way home because he didn’t feel like napping at school. We scrub our planned meal (spaghetti squash casserole) due to time constraints (Ben wasn’t planning on going to my appointment). Ben usually cooks since he’s home first. 5:00 – Ben and I try to have a conversation while E yells at us not to talk and throws things at the tv. 5:20 – Ben gets dinner ready. We end up with fake chicken nuggets and potatoes/veggies. Not the best meal but not the worst. I entertain a very cranky E.
5:45 – Dinner time. We try to have family dinner at the table every night. 6:10 – We play Wii Sports Resort for a few minutes because E has been asking for an hour. Evan likes sword-fighting the best. 6:25 – Ben leaves for his adjunct teaching job. Evan and I switch to watching Octonauts (lots of screen time on a no-nap/extra-whiny day). I do the dishes and pick up while E watches the show. 6:48 – I decide we need to do something other than watch tv and we color and use stamps for a bit. 7pm – Bath time. This is a half hour earlier than usual but E is beyond tired and I am out of ideas to keep him from melting down. After I wash him, I let him play in the water while I fold and put his clothes away. 7:25 – I finally get E out of the bath and go through the bedtime routine. Pajamas, brush teeth, read 3 books, sleep sack, close curtains, turn off light, play music, give hugs and kisses, and tuck Evan into bed. 7:48 – I leave E’s room. We’re usually done around 8 but the head start helped me out. He’s easy to put down. I don’t expect to hear a peep until morning. 7:50 – I consider washing my hair but convince myself I can get one more day out of this wash (yay, long hair). I go downstairs and make tea (Stash Spice Dragon Red Chai decaf) and read (The Winner’s Curse) instead. I’m probably only reading because I know I’m doing this post. If I’m honest, I’d have picked Gilmore Girls otherwise. 8:25 – Ben comes home from his class. We chat for a few minutes about lazy students and anti-vaxxers. We spend time trying to figure out how to watch already-aired NBC shows on one of the tvs (no cable). We ponder why there is no NBC app for either Apple TV and Roku. We finally decide to just plug the chromebook into the TV and realize that isn’t working either (cable cutting certainly takes a bit of effort). 9pm – Ben and I watch some Parks and Rec. We are really behind. I eat a bowl of cereal. I am always hungry. 9:50 – We decide to head upstairs early. We get ready for bed. 10pm – We watch Friends in bed. 10:30pm – We are both asleep. This is about right for Ben but early for me. I’m rarely asleep before 11. I generally stay up watching more Gilmore Girls and/or gchatting with Jen. I meant to post this yesterday, but since he still asked for this book last night, I haven’t missed my chance. 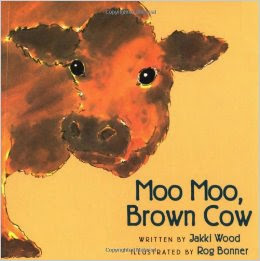 This week is all about Moo Moo, Brown Cow by Jakki Wood and illustrated by Rog Bonner. I like this book because of its rythym, which is why the last animals response, which doesn’t fit the responses of all of the other animals kills me. Evan asks for Moo Moo, Brown Cow at least once a day, so I guess it doesn’t bother him. I do love that he says, “oh there is a little fry” when I ask about the small fry though. To round out an ENTIRE WEEK OF DAILY POSTS, I am going to try a new just-for-fun Friday series, sharing Evan’s favorite book of the moment. The other night, I read this to E four times in a row after Ben read it six times in a row. It’s a silly little Doctor Seuss book about opposites and the different kinds of “feet you meet.” My favorite part about reading this one is that Evan seriously believes I just skip the word “foot” in the first page. Me: Left foot. Right foot. Left foot. Right. Evan: Foot. Every. Single. Time. Apparently he thinks I’m pulling one of my pause-and-see-if-Evan-will-supply-the-word tricks. He can’t be convinced otherwise. What book are your kids demanding this week? Or what book do you have fond (or not so fond) memories of reading with your kids or parents?